BrightSparkz was established in 2007 by 3 university students who saw a need for private tutoring. 12 years later, BrightSparkz has branches in Cape Town, Port Elizabeth, Durban, Johannesburg and Pretoria, and offers online tutoring countrywide. From offering tutoring for a few school subjects, BrightSparkz now offers tutoring for all school and university subjects, adult languages, Language Boot Camps (Afrikaans, Zulu, French and more in the pipeline), Concessions Facilitators (readers, scribes, prompters and invigilators), a Study Skills Crash Course, location tutoring and childminding on film sets, and more! The directors, Amy Stockwell and Dominique Oebell, are women with a big plan: to be recognised by schools, universities, parents, and students across South Africa as the “go-to” and “gold standard” for quality tutoring and learning support, and as the learning company that has provided the most amazing opportunities for learners, tutors, and edu-professionals. In support of this goal, they have launched Project 10 000. This project is committed to donating 10 000 tutoring hours to learners who wouldn’t otherwise be able to afford educational support, over 3 years. In addition to this, BrightSparkz is a certified Level 4 BEE contributor, and is committed to improving opportunities for young women in South Africa. Approximately 70% of our Project 10 000 sponsored learners are female! 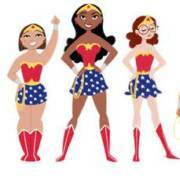 If you would like to find out more about our fantastic tutors, or would like to request your own BrightSparkz Superwoman tutor, get in touch with us today!